My Notes: I wanted to install and use FFMPEG in conjunction with RASPIVID on the Raspberry Pi. The goal is to stream video to my YouTube Channel which can then be used to publish video (live or recorded) to a website. I am using the official Raspberry Pi camera which plugs into the RPi Board. I decided to do this because the video quality should be much better because it is directly plugged into the bus. If you use the RPi camera, then you have to turn on the camera feature/function using “sudo raspi-config”. The FCDReferral (v. 1.08) known as the Fixed Content Provider Referral Utility is a utility provided by IBM and used in a FileNet P8 environment. 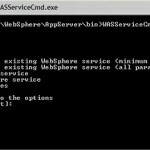 Environment: WebSphere 7.0.0.37 ND, Windows 2008 Servers. 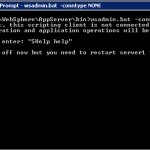 IBM WebSphere Server and IBM WebSphere Agent setup to run as a service on Windows 2008 Servers. Problem: IBM WebSphere Server “Windows Service” goes to stopped state. The actual “Java” is still running and all applications are functional. Instructions on clearing the java class caches in IBM WebSphere Application Server. Both the JVM’s shared class cache and WebSphere Application Server’s OSGi class cache. I ran into a problem this month where our WebSphere Windows service account stopped working. This is for our FileNet P8 Environment.